Enjoy yourself year-round with POLYWOOD® All-Weather Adirondack Chairs. 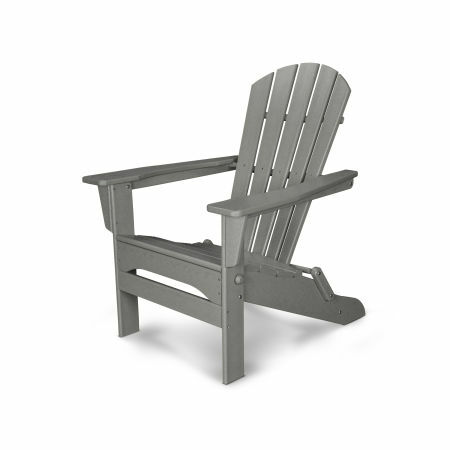 Our Adirondacks are constructed from HDPE lumber and boast superior craftsmanship that can withstand any season. Nothing is more unpredictable than the weather, but one thing never changes: outdoor furniture is exposed to a variety of environmental stressors like rain, wind, sun, snow, hail, sea spray—you name it. Natural wood “all-weather” Adirondacks are susceptible to the elements and often succumb to rot, mildew, insect infestations or worse within a few years. Even “weather-resistant” Adirondack chairs often deteriorate after a few years of relentless exposure to the elements. This is not only costly, but it’s frustrating to have to purchase new outdoor furniture every few years. Made from recycled, eco-friendly plastics, POLYWOOD® All-Weather Adirondack Chairs are capable of withstanding anything Mother Nature throws at them, giving you reliable comfort and beauty to enjoy for years to come. We stand by our products with a 20-year guarantee. POLYWOOD® All-Weather Adirondack Chairs are built to survive for many years outside, weathering storms, harsh UV rays, and heavy precipitation without showing any wear and tear. Made from a high-density polyethylene (HDPE) material, our Adirondacks will not rot, peel, chip, fade, splinter, or crack, no matter how brutal the weather. 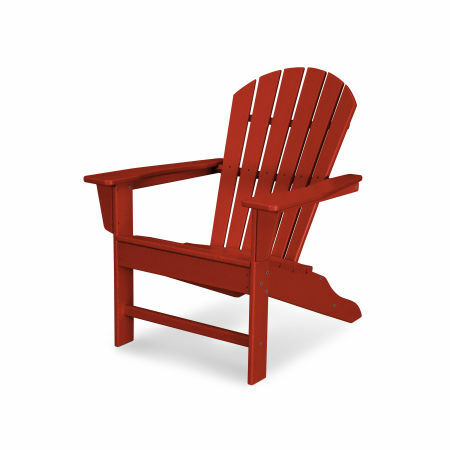 Durable POLYWOOD® HDPE lumber gives the look of painted wood, minus the need to stain or add protective sealants like wooden Adirondack chairs require. Solid, heavy-duty construction stands up to the elements and its unique construction makes POLYWOOD® outdoor furniture resistant to anything Mother Nature sets in its path. Our lumber is made from post-consumer bottle waste — think recycled milk jugs. Eco-friendly and durable, genuine POLYWOOD® lumber also contains UV-inhibited pigment systems to stop bright colors from fading after years of sun exposure. You don’t have to worry about greasy food or other corrosive materials harming your chair, either! Our proprietary blend of purified polymers was specially formulated to withstand a variety of environmental stresses. When it comes to all-weather Adirondack furniture, no one does it better than POLYWOOD®. Protecting your investment and maintaining most outdoor furniture can be a drag: sanding, staining, and waterproofing are all necessary maintenance with other Adirondack chairs. Not so with POLYWOOD® Adirondack Chairs. You’ll never have to concern yourself with repairing splintered or cracked wood, sun-faded colors, or unflattering peeling paint — our colors run all the way through the lumber. Cleaning is effortless, too. All that’s required is soap, water, and a good rinse, and your all-weather Adirondack furniture will look as good as the day you bought it. Relieved of the burden of constant upkeep, you’ll have more time to enjoy the glory of the outdoors in your backyard oasis. Go Ahead. Leave Your Furniture Outside. When the wind is howling and rain is pelting at your windows, the last thing you want to do is lug your outdoor furniture inside or struggle to protect it with a cover that refuses to stay put. Worse than worrying about a cover blowing off during a storm, you may worry about your furniture staying put in high winds. With POLYWOOD® Weather-Resistant Adirondack Chairs, you don’t have to do a thing when the weatherman warns of impending inclement weather. POLYWOOD® All-Weather Furniture was specifically built to withstand even the most brutal environmental stresses. In addition to it being resistant to the elements, our outdoor furniture is substantial and sturdy enough to stay in place during torrential storms. It’s not easy to find attractive, durable outdoor furniture that matches the color scheme or palette of your home’s outdoor space. Our outdoor furniture shines when it comes to providing a variety of color to choose from. Try a vivid Sunset Red or Tangerine for a pop of color, or a brilliant Aruba or Pacific Blue. If you prefer more traditional hues, our Sand, Mahogany, or Slate Grey all blend perfectly with a muted palette. The best part is that you can rest assured the pigment of your Adirondack chair will continue to look great despite repeated exposure to the sun and other elements. POLYWOOD® furniture remains vibrant thanks to consistent coloring throughout our lumber and UV-inhibiting pigment systems. Not sure which color best suits your dream retreat? Contact our Customer Experience Team for samples of your favorite colors so you can see what they look like in real life. Whether you’re moving to a new home or packing your outdoor furniture away for the season, there’s no need to reassemble your chairs. We offer a selection of all-weather folding Adirondack chairs that are perfect for storing or moving to other locales. While POLYWOOD® Adirondack Chairs are intentionally crafted for superlative comfort, if you’re looking to amp up the indulgence factor, try a cushion or headrest pillow. Fashioned from stain-resistant, mildew-resistant Sunbrella® upholstery fabric, a cushion offers an additional luxury as well as a pleasing aesthetic element. Choose from a wide variety of colors and styles, including seat-only and full cushion options. When it comes to the best, you can’t go wrong with POLYWOOD® All-Weather Adirondack Chairs. Our furniture is proudly made in the USA and our lumber is backed by a 20-year guarantee. Put your faith in us and you’ll join thousands of other satisfied repeat customers.